While their musicBox experience is still relatively new, the Schwartz’s love their new musicBox system, and are constantly discovering new features, like waking up and falling asleep to their favorite tunes. As Ron explains “Life is better with music. The musicBox makes this a reality, allowing each of us to listen to our own tunes, and live in harmony (pun intended)”. Ron and Kelly’s love for water and Florida sunsets, made living on the water a must. 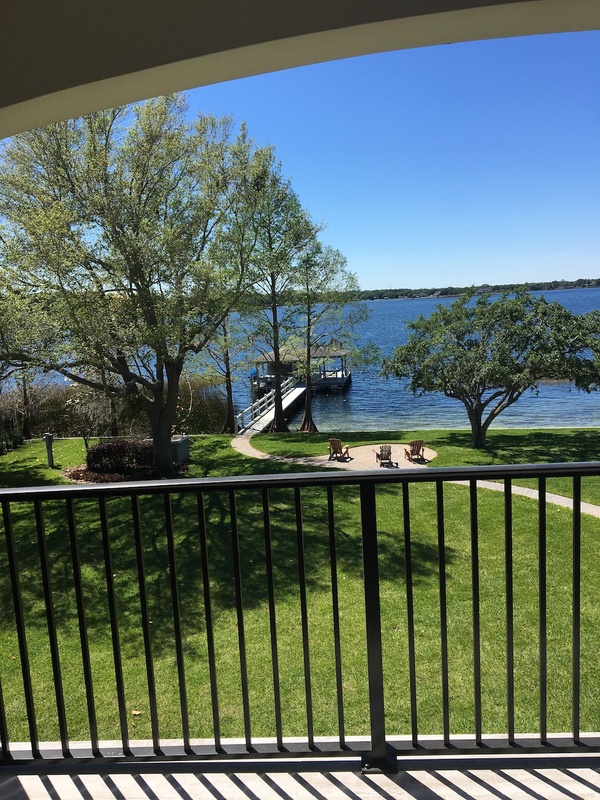 Although most couples opt to downsize when they become empty nesters, this couple wanted to build their dream home on beautiful Lake Down in Windemere, Florida. By building a larger home on the lake, the couple provides their own "destination" for family and friends. After researching the various available products on the market, Ron decided to go with the musicBox 6 system, and contacted the company for assistance in designing their whole house music system. Ron chose the musicBox 6 system because it was one of the few systems that was specifically targeted at DIYers, offered complete App control over their whole house music, could scale to support their large home, and included built-in Apple AirPlay support for each room. After consulting with the musicBox 6 team, Ron decided to install speakers in all 4 bedrooms, master bathroom, kitchen, living room, dining room, office, library, upstairs TV room, and various outdoor areas, including porches, as well as pre-wiring the pool and backyard for landscape speakers. The home includes a total of 14 zones (or listening areas). After completing the design with help from the musicBox 6 team, Ron had his electrician pull all the speaker wire (16/4 CL3) for the job. The speaker wire was run to a centralized location in the home, Ron’s office closet, where the electrician also installed a dedicated 20A circuit for the musicBox 6 equipment. The Schwartz's decided not to install the keypads, as they prefer to use their iPhones and iPads to control their music. Ron selected the CasaTunes musicBox 18 room system (CT-MB18). The musicBox components are installed in a wall mountable Tripp Lite 12U rack mount system. 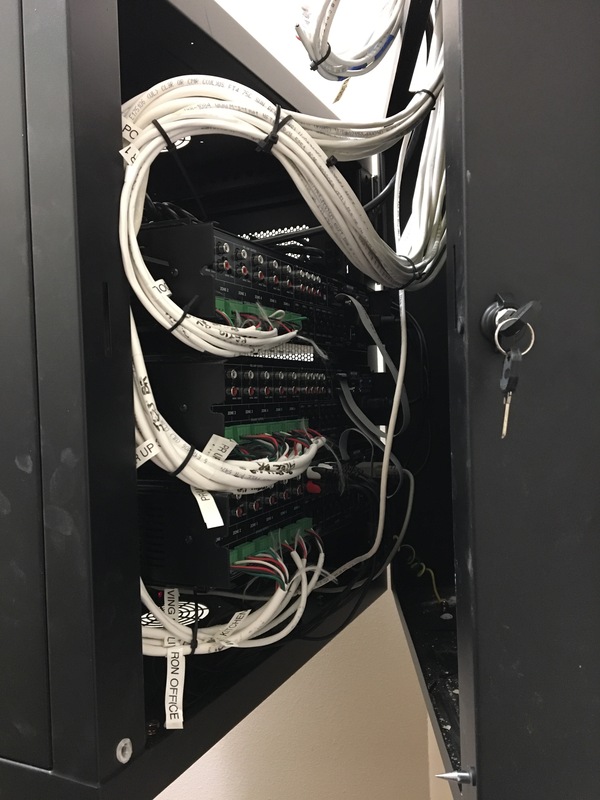 This rack mount system was selected for it’s small size and because it could be mounted on the wall out of the way, and yet, allow easy access for installation and maintenance. 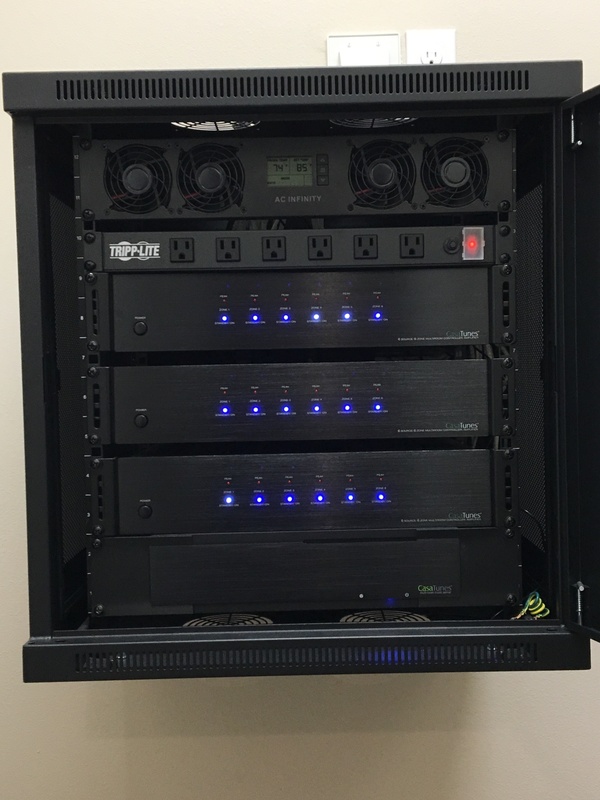 In addition to installing the musicBox 18 room system components in the rack, Ron installed a Tripp Lite rack mount power strip. Since the rack was placed in the closet in Ron’s office, it was very important the equipment did not generate a lot of noise while keeping the equipment cool. 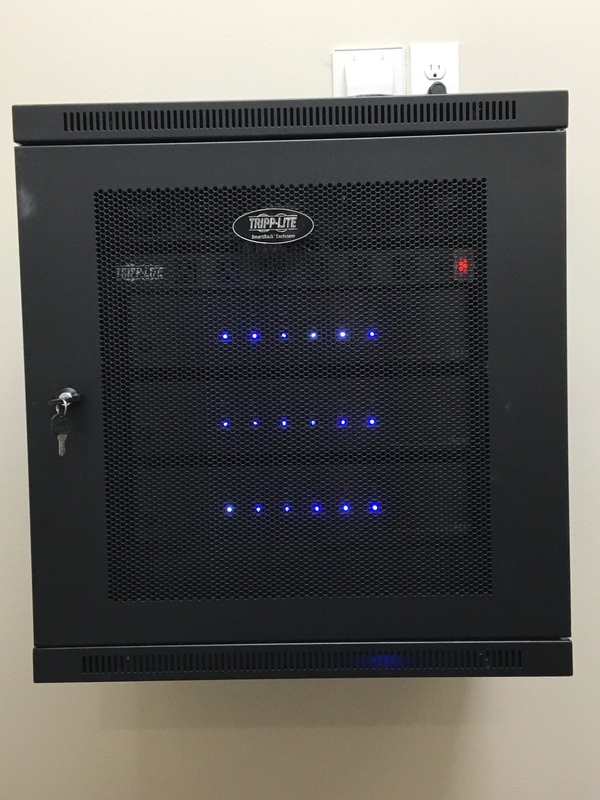 To address the noise requirements and equipment cooling needs, Ron installed a quiet 2U rack mount intelligent cooling fan system from AC Infinity, which is a very quiet rack mount fan that automatically adjusts the fan speed based on the internal temperature and the target temperature, ensuring the rack temperature remains within the ideal operating range. To ensure for proper ventilation for the musicBox equipment installed in the closet, Ron also had his HVAC subcontractor install a vent in the closet. 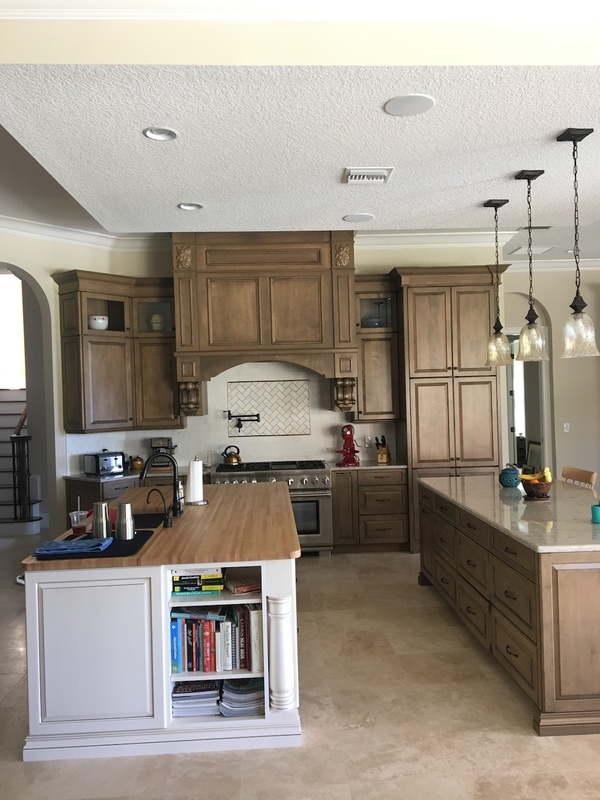 The Schwartz’s selected to install mid-price point speakers from Proficient Audio, and selected the 6.5” C626 ceiling speakers. These provide a sweet sounding and nicely balanced woofer/tweeter combination. Outdoors, the Schwartz’s installed Proficient Audio’s outdoor AWS650 wall mounted speakers. Each outdoor speaker was powered by configuring the musicBox’s Bridged Mode option, essentially quadrupling the power per speaker. The Schwartz’s configured a player for each family member, a total of 4, one for Kelley, Ron and the two kids. This makes it easy for each family member to listen to their own music without impacting the other. When it came to playing music, both Ron and Kelley had their own existing iTunes music on their own computers, and this music was configured to be automatically copied and synchronized with their musicBox 6 music server. Now, whenever they make changes to their iTunes library on their computers, these changes are automatically synchronized with the musicBox 6 music server. In addition, since the music has been copied to the music server, they no longer need to keep their computers on to listen to their music. Ron also purchased a Spotify Family subscription and configured a separate account for each family player, so that everyone can also listen to their own Spotify without affecting each other. While their musicBox experience is still relatively new, the Schwartz’s love their new musicBox system, and are constantly discovering new features, like waking up and falling asleep to their favorite tunes. As Ron explains “Life is better with music. The musicBox makes this a reality, allowing each of us to listen to our own tunes, and live in harmony (pun intended)”. We could not have said it better!